The Charles Bridge is 621 metres (2,037 ft) long and nearly 10 metres (33 ft) wide, resting on 16 arches shielded by ice guards. 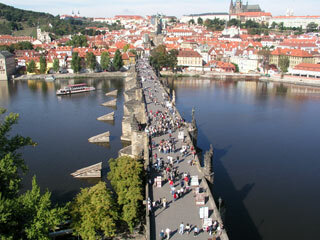 It is protected by three bridge towers, two of them on the Lesser Quarter side and the third one on the Old Town side. The Old Town bridge tower is often[vague] considered to be one of the most astonishing civil gothic-style buildings in the world. The bridge is decorated by a continuous alley of 30 statues and statuaries, most of them baroque-style, originally erected around 1700 but now all replaced by replicas. This article uses material from the Wikipedia article "Charles Bridge", which is released under the Creative Commons Attribution-Share-Alike 3.0 License.